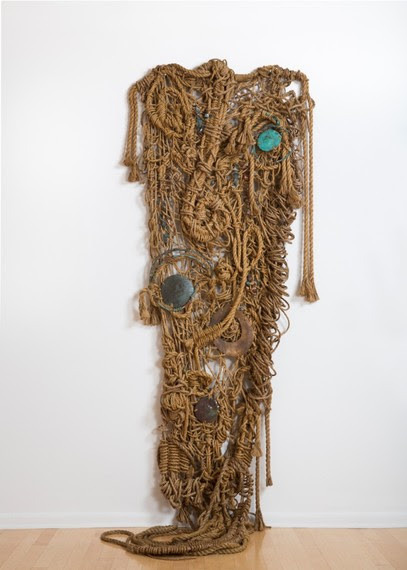 Susan Beallor Snyder — whose work is now on view in the group exhibition “GATHERED” at The Museum of Contemporary Art of Georgia — makes ambitious and compelling Manila rope reliefs that represent the culmination of a lifetime of creative impulses. First, as a photographer, then as a goldsmith, Beallor Snyder channeled her creativity into traditional media, but her discovery of the work of Magdalena Abakanowicz provided an “aha” moment that led to her adoption of an unexpected material with spectacular expressive results. Tapping into themes of personal growth and pain, Beallor Snyder has created a body of work that is physically imposing but also deeply lyrical. Having hit her stride as an artist, Susan Beallor Snyder has created a highly individual and remarkably powerful body of work: she stands poised to take her art into new expressive territory. SBS: I was born and raised on the Upper West Side of Manhattan, and began shooting black and white photos while I was a student at the High School of Art and Design in New York. I followed the work of Edward Steichen, Alfred Stieglitz, Margaret Bourke-White and others, but my favorite photographer at that time and my biggest inspiration was Edward Steichen. I loved how he captured the quality of light in his photographs. In the late ’70s I worked as a waitress at Sardi’s restaurant and would carry my camera everywhere. I developed my work at night in a closet studio I had set up in my apartment on West End Avenue and 80th Street. In 1982 I got a job working at ABC News Closeup as assistant to the executive producer, Pamela Hill. It was during my time there that I reconnected with a friend I had met near our summer home in upstate New York. We fell in love and his career took us to Los Angeles, California, in 1987, and we were married a year later in Greenwich, Connecticut. I missed the streets of New York and lost my inspiration to shoot, and I began to study Ansel Adams’ Zone method. I set up a darkroom in our house in Woodland Hills. During this time, I worked for the producer Joel Silver; Dawn Steel, who ran Columbia Pictures; and Coline Serreau, a director and writer. SBS: In 1985 my father was diagnosed with thyroid cancer, and my parents decided to follow a macrobiotic diet and lifestyle instead of following the conventional medical path. In order to be supportive of my father’s healing, I started to read about their new diet and was so inspired that I completely changed my eating habits. It was about that time that I was starting to have my own health crisis. After Sara was born, I decided to start my own business making gourmet macrobiotic meals in my home and coaching others who wanted to transform their diets to a healthier way of eating. After living in California for some time we eventually moved to Atlanta, where I continued helping others with healthy food and coaching, and had our second daughter, Madison, in 1995. All the while my health was in decline. I had terrible chronic fatigue and did what I could to keep up with our busy lifestyles as my husband’s career progressed. SBS: It was 1999, and we were living in Maryland and moving to New York for a job opportunity for my husband. I had decided that I missed my life as an artist and ordered a 92nd Street Y catalogue to look for art classes. I had studied art there as a child and knew they were well known for their high quality teachers and classes. I don’t paint or draw but I wanted to do something with my hands that was more tactile than photography. I wanted to learn something new. They didn’t have woodworking or metalworking classes, but they offered a wide variety of jewelry classes. I didn’t wear much jewelry, but I thought I would learn to solder and make table sculptures. I was thrilled to be moving back to New York and to have an opportunity to make art again. I began with the most basic jewelry class, called Absolute Beginners. I was hooked. I took one class after another until I discovered high karat gold and classical goldsmithing. I continued my education at the Jewelry Arts Institute, where they specialize in the ancient methods of classical goldsmithing. I began selling my jewelry through gallery stores around the United States. SBS: It was difficult, and the moves were disruptive and took a lot of my energy. My oldest got involved in theater, and I began doing some photography again in connection with that. I was making some jewelry too, but then the price of gold went through the roof. Still, I needed an outlet and was feeling the urge to make and exhibit something. Nobody wanted to exhibit jewelry, so I thought about exhibiting my photography. A photographer friend and mentor, Jerry Siegel, kept encouraging me to shoot outside of theater to build a body of work, but as a New York street photographer I wasn’t inspired by the streets of Atlanta. One day I realized that I had a body of work in the form of the 20-year-old negatives in my garage. SBS: After the show and exhibiting my old photographs, I decided I wanted to work larger and became interested in sculpture. I took a few classes at SCAD (Savannah College of Art and Design) for professional development, and a professor there introduced me to the work of artist Magdalena Abakanowicz. I was inspired by an article in the New York Times that talked about her Abakans series that she began in her small one room apartment in Warsaw in the late ’50s. She used fiber because she could fold them up and put them under her bed. I was drawn to the large scale as well as her ability to express emotion; the fiber was rough and stiff and she was able to make a statement about the world around her. 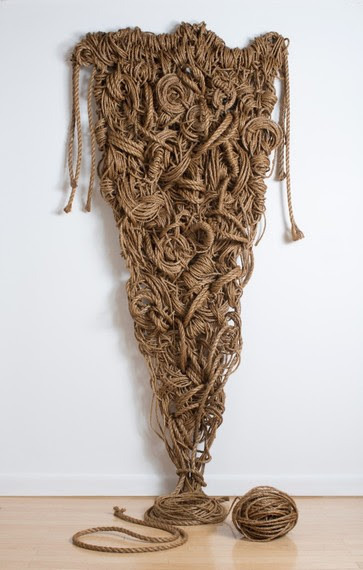 SBS: The first piece I did with manila rope is called Inner Struggle. This piece represents my desire to express the frustrations I felt in my corporate wife and mother role. By this time, 2011, I had spent years raising the kids, moving for my husband’s work, and playing the role of corporate wife–all things I chose and wanted to do, but I felt that I was losing myself as an artist, woman and individual. I wanted to find more time for me. I wanted to create artwork that would represent those emotions. 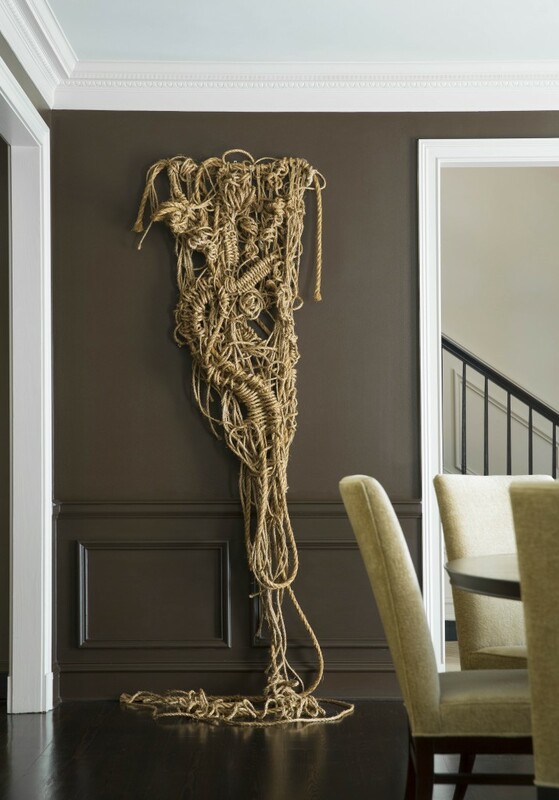 I felt that the natural manila rope that I had discovered and used for this first piece was the perfect material. It was rough and held together yet was also pliable and possible to manipulate. 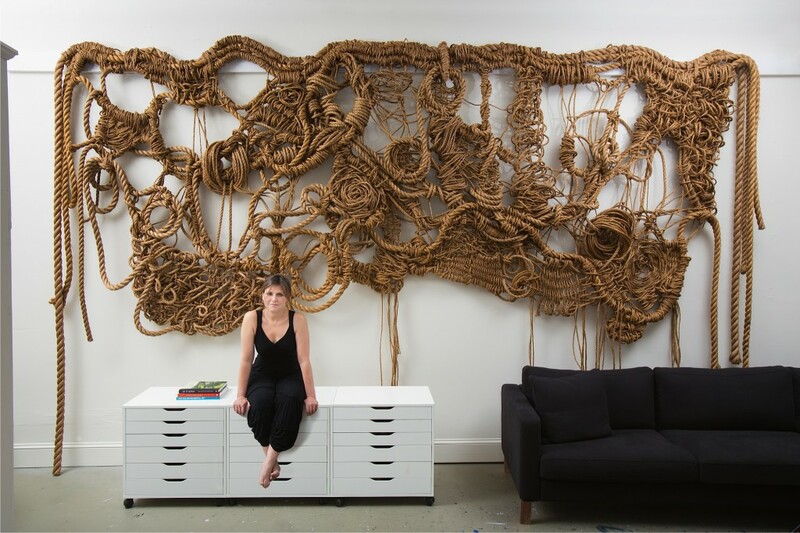 The forms I create with rope are able to express pain and angst while also presenting themselves as beautiful, flowing forms. My second rope piece was Expectations. It includes patina copper “eyes” that say something about all the people in my life watching and judging and about the obligations and expectations I felt. I have come to realize that in some way these expectations were self-imposed. I could easily have created a life for myself where my art would be the top priority, but I chose to give that up in order to be married to my husband and be involved in my children’s lives. This rope sculpture expresses my personal feelings, but is also meant to connect with others who have felt similar struggles between the needs of others and their own expressive needs. SBS: This work is physically challenging. The rope gets into my fingers, and the pain of creating these pieces is similar to the pain and emotion that many of them represent. I create them on the floor and loom over them on a tall ladder as they develop. There is a lot of repetitive motion, and that is where my thoughts can wander and the work becomes an extension of my mind and emotions. The work speaks to me. It is intuitive and spontaneous. I sometimes feel like Jackson Pollock with rope. The work evolves as I create. There are no sketched studies before I begin. I usually have a shape and size in mind and then I begin. There have been times when I have worked for days only to realize that the piece is not working and I have to pull it all apart and begin again. I look at them from above to get a sense of the whole piece, but it isn’t until they are hung that they really show themselves. SBS: In making my first works in this medium, I often found myself angry and frustrated, and those titles reflected that. However, one day I noticed I was feeling peaceful and happy, and the title Women’s Work came to me. It wasn’t all about me. It was about all the women of the world who are the caretakers of the world. 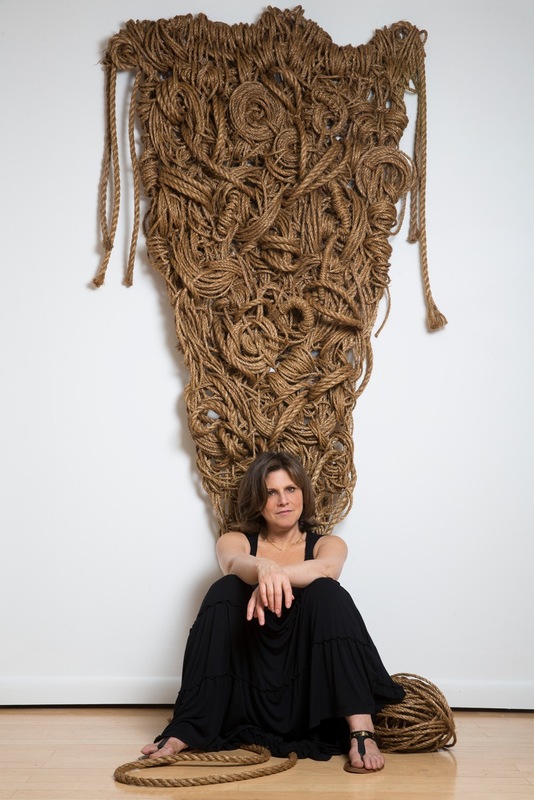 Women have been using fibers since ancient times, and I realized that my work was not only about me but that everyone–man, woman, and child–could relate to my work as I titled it and find their own story in any of the pieces I create.